The Old North is a relatively quiet and beautiful residential area close to both the beach and park. 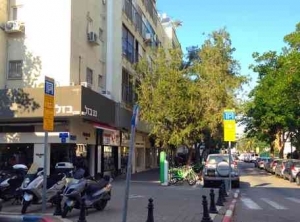 Beating heart is the long and elegant Dizengoff Street, full with coffee shops, boutiques, restaurants and bars. Famous is the lively intersection with Yirmiyahu Street, where there’s always something going on. More relaxed is the Basel area, which has a real neighborhood feel to it. It’s just a short walk to the Tel Aviv Port, with its shops and restaurants that are also open on shabbat. Especially during summer a lot of activities are being held there. For a breath of fresh air there’s the HaYarkon Park, the green lungs of Tel Aviv. People, run, walk, eat and play in this huge park, that leads all the way to Ramat Gan. You can even catch a boat or water bike. Famous is the sushi at Fusushi or the always busy Thai restaurant Nam. Fine dining is possible at Sheila’s on Ben Yehuda or in the Kitchen Market in the port, where in the surrounding market you can buy the freshest produce in town. Go for lunch or diner at the Room Service which has an amazing vibe, and sip form their famously huge cocktails. The Old North might be relatively quiet, it’s never dull. Close to Tel Aviv University, is has easy access to the highway. Because of the service taxi’s 4 & 5 it also has a good connection with the rest of Tel Aviv.